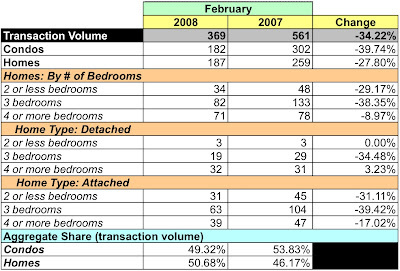 MRIS has released its data for sales of existing home sales in February 2008. Fewer units sold, lower dollar volume, condo prices down, single family home prices up. More of the same. The data continue to show that single family homes are selling for higher prices despite collapsing sales volumes. I think the high end market continues to distort how well the overall market is performing. Of the 369 units that sold, 26 - or 7.05% - sold for more than $1M. Lacking data granularity, it's hard to discern the dollar volume weighting of those units. However, if each sold for only $1M they'd represent slightly more than 14% of the month's dollar volume. Average days on market... ah, who cares. Sales volume. Overall, down 34.22%. YoY, condo and home sales volume dropped through the floor, down 39.74% and 27.8% respectively. Sales volume was negative across the board. For the second consecutive month, condos represented less than half of the units sold, 49.32%. Dollar volume. In aggregate, down 32.66%. YoY, condos were down almost 41.15% while homes were down 26.23%. Dollar volume was negative for every category of housing except two bedroom detached. Otherwise, it really became "which did worse?" The "best" [least worst] performance was -4.46% for detached homes with 4+ bedrooms. Average sales price. Overall, up 2.38% YoY; basically flat when adjusted for inflation. 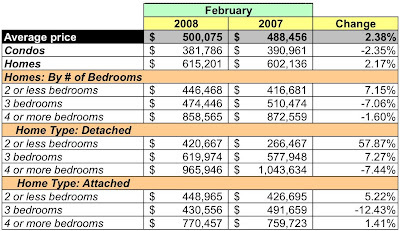 Condos fell 2.35% to $381,786 while homes increased 2.17% YoY to $615,201. Days on market. DOM was 92 days. Fact? Fiction? Who knows? Assuming fact, then it's gotten worse since January . Inventory. Based on the month's transaction rates and active listings, there is a 8.28 month supply of condos, a 12.84% decrease from January, while home inventories are at 9.08 month's supply, essentially no change from January. Essentially, February continues a downward trend that began in July. When dollar and sales volume each fall by more than 30%, it ain't good out there. Slip sliding away.